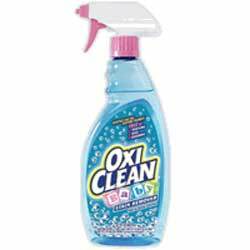 OxiClean Baby Stain Remover is a versatile stain remover for baby clothes and other washable fabrics. When bad stains happen to good clothes, this powerful baby stain remover will keep your baby washables looking great. Removes the toughest baby stains and odors: baby food, baby formula, diaper leakage, spit up, jelly, spaghetti sauce, juice and more. Versatile: For washable baby dress clothes, play clothes, linens, blankets, pajamas, car seat and stroller fabrics, bibs and more. 100% fragrance, dye and chlorine free.